armor of Achilles ready for the coming war. feet treading softly on fathomless water again. Nels Hanson grew up on a small raisin and tree fruit farm in the San Joaquin Valley of California, earned degrees from U.C. 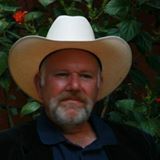 Santa Cruz and the U of Montana, and has worked as a farmer, teacher and contract writer/editor. His fiction received the San Francisco Foundation’s James D. Phelan Award and Pushcart nominations in 2010, 2012, 2014 and 2016. His poems received a 2014 Pushcart nomination, Sharkpack Review’s 2014 Prospero Prize, and 2015 and 2016 Best of the Net nominations. He lives with his wife Vicki on California’s Central Coast. If you like Nels' work, check out his piece, "A List", which was published by iō earlier this year.